Researchers at the Large Hadron Collider b (LHCb) collaboration have discovered two never-before-observed particles conforming to the ‘quark-model’ of physics in high-energy collisions. Excitingly, the team has also uncovered enticing hints at a third more exotic particle. The hope is that further study of these particles will lead researchers to a deeper understanding of the force which binds quarks together to form larger particles. The newly discovered particles are of the same family as familiar particles such as protons and neutrons, which form the atomic nucleus of all elements, baryons. A baryon is a subatomic particle made up of three quarks. The particles that the LHCb team have discovered differ from protons and neutrons in the respect that the quarks that make them up are a different arrangement than previously discovered. A proton is comprised of ‘up’ (u) quarks and one ‘down’ quark (d). 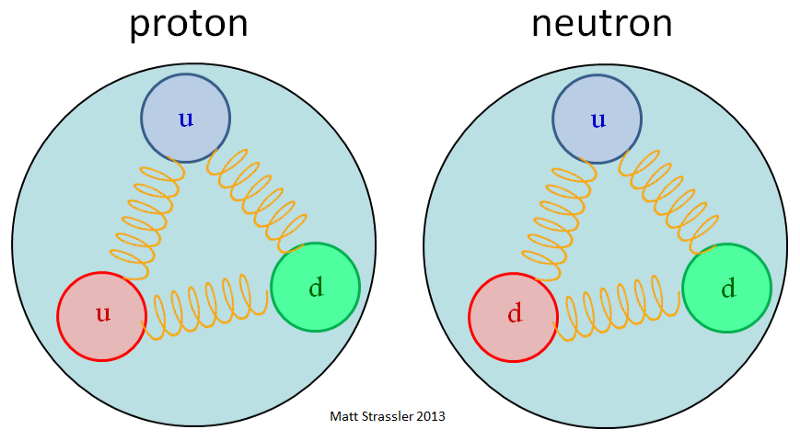 Whilst a neutron is comprised of two ‘down’ quarks and an ‘up’ quark. Below is a diagram of the traditional arrangement found in protons (uud) and neutrons (udd) bound by the strong nuclear force. In addition to existing in ‘up’ and ‘down’ forms. quarks also exist in larger pairs ‘charm’ and ‘strange’ and larger still versions ‘top’ (t) and ‘bottom’ (b). The newly discovered particles named Σb(6097)+ and Σb(6097)- are comprised of one bottom quark and two up quarks (buu) or one bottom quark and two down quarks (bdd) respectively. The “6097” in the name refers to the mass of the particles in MeV, making them roughly six times more massive than the proton. Related particles have previously been discovered by Fermilab based in Illinois, but this is the first time that larger mass counterparts have been detected. 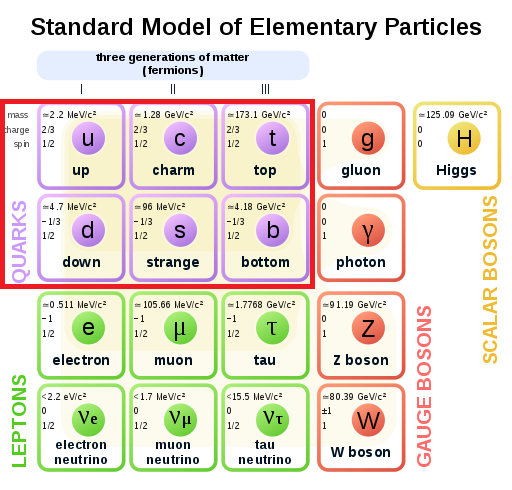 Excitingly the third particle which has been named Zc-(4100)which was not observed but was strongly hinted at, is a candidate for an entirely different quark arrangement, not made of the usual two or three quarks but of two quarks and two anti-quarks. These exotic particles have been named “tetraquarks” and have long predicted to exist alongside even larger quark collaborations “pentaquarks” containing five quarks. The team at LHCb discovered these new particles by using a common “particle-hunting” technique that revolves around looking for an excess of events or a “bump” in the data obtained from particle collisions. The Zc-(4100) resulted from the observation of structures produced in the beta-decay of heavier B mesons. 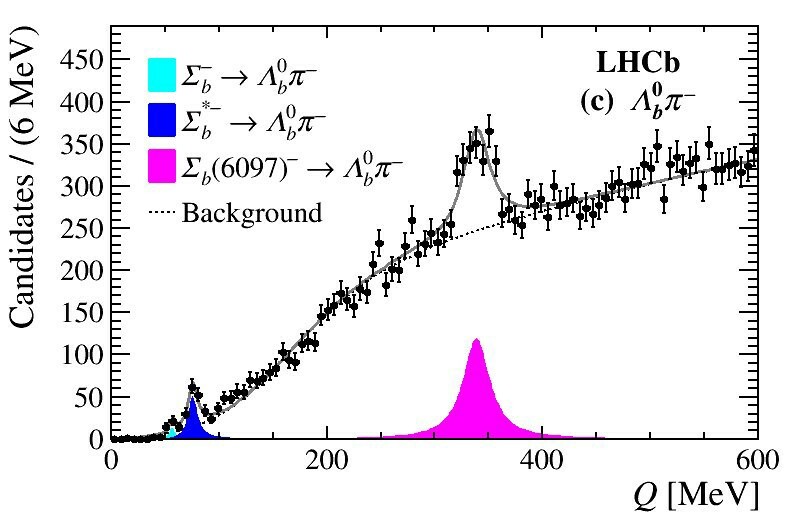 It is hoped that the Zc-(4100) particle can be confirmed by further experimentation as the level of confidence for its discovery, 3 standard deviations, is thus far much lower than that of Σb(6097)+ and Σb(6097)- which stands at over 12 standard deviations. The required level for classifying a discovery is at least 5 standard deviations. The team at LHCb, who have submitted the findings for publication to various physics journals, hope that continued exploration of these newly discovered particles may shed light on the ‘strong nuclear force’, one of the four fundamental forces of nature, which is responsible or not only binding quarks together, but also neutrons and protons.